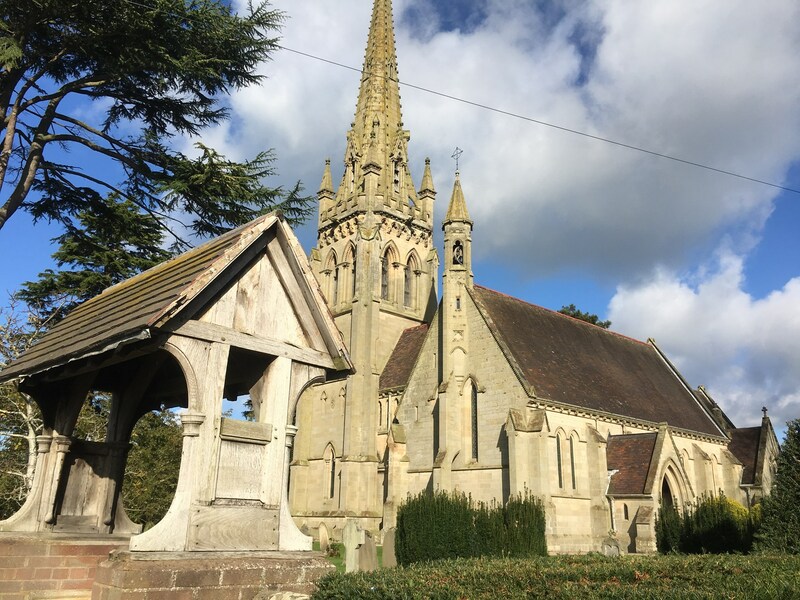 This plan sets the Bomere Heath and District Parish Council (BHDPC) vision for the parish, its purpose, values, objectives and key priorities for the next three years. 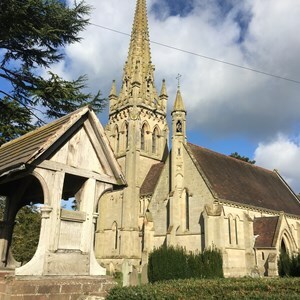 BHDPC district is situated north of Shrewsbury and includes the village of Bomere Heath and the outlying settlements of Leaton, Merrington, Albrighton, Fitz, Mytton, Forton Heath, Walford Heath, Preston Gubbals, and Grafton. The aim of the Business Plan is to give residents within the parish a clear understanding of what the Parish Council does and what it is trying to achieve. It details what the Parish Council intends to focus on over the coming term and how it will achieve set objectives. The Business Plan is a live document that we will review annually, use it to drive the budget process, plan activities for the coming years and enable the Parish Council to monitor its progress against key priorities. Having an agreed strategy provides a framework for the Parish Council to work within, enabling it to operate in a more consistent and co-ordinated way, to be proactive rather than reactive in its decision-making. 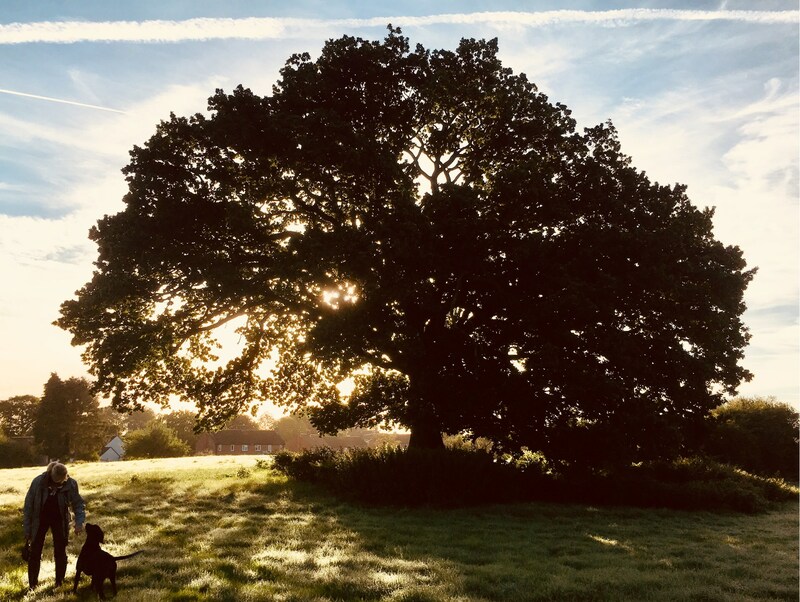 We have based the Plan on our understanding of our community’s needs gathered from our day-to-day involvement with residents and the public consultation, which took place within the parish in January 2017 - Community Led Plan (CLP). At the same time, the Business Plan will help the local community to have a better understanding of what the Parish Council does and also clarify what it doesn’t do; in other words to explain what issues fall under the responsibility of other delivery bodies. The Business Plan is a statement of intent, however, BHDPC may have to make decisions contrary to our stated commitments if events such as budget constraints, new legislation or changes in our policies make that necessary. Any changes will, however, be reflected in an updated Action Plan which accompanies this Business Plan. The Action Plan will be a ‘live’ document, which the Parish Council will update regularly, enabling it to track, and monitor its progress against the key priorities. Because the plans will be publicly available, parishioners will also be able to monitor progress. There are three tiers of government, each with differing responsibilities. 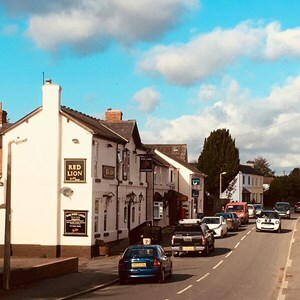 Town and Parish councils are the first local tier, and BHDPC has an important role to play in promoting the village and the outlying settlements. Despite the name, BHDPC is not aligned to any religious denominations. 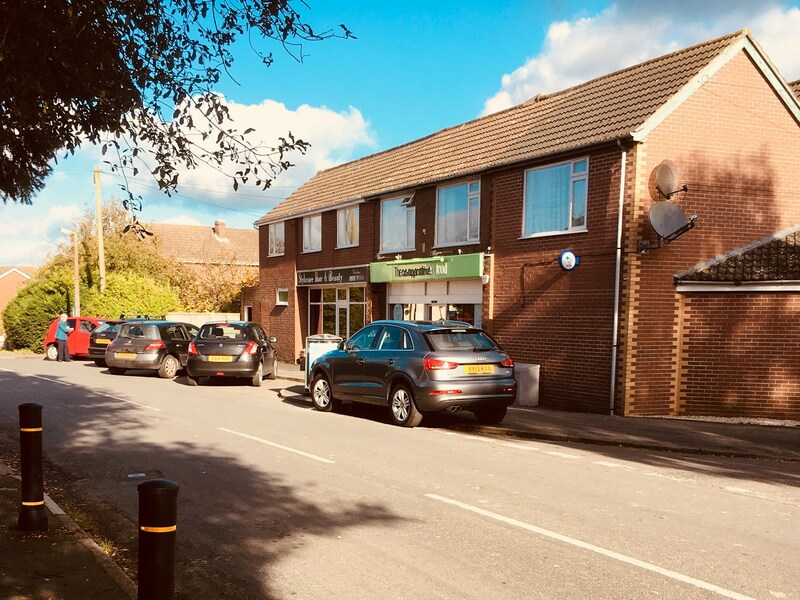 Shropshire Council (SC) is the second local tier and is responsible for services on a County level, which includes: housing, environmental services, highways, relating to both roads and footways (pavements), education, health and social services, public rights of way and libraries. SC provides for strategic planning policies for all development (including housing and employment sites) via its Local Plan. The third tier is National Central Government at Westminster. Residents within the BHDPC district elect Parish Councillors every four years. The Council elects a Chairman and Vice-Chairman annually at the Annual Parish Council Meeting in May. The Council reports to the electorate at the Annual Parish Meeting held in the following April. Councillors are unpaid. We commit our time to improving the BHDPC district and maintaining it as an attractive and sustainable place in which to live, visit and do business. Elections are held every four years. The last was held in May 2017 and the next election will be in May 2021. The full Council meets on the second Wednesday each month in the Parish, either at Bomere Heath or Fitz village hall. All meetings are open to the public with a period set aside for members of the public to address the Council. The Council works to its Standing Orders and Financial Regulations, these lay down the rules by which we operate and conduct our business. We also expect Parish Councillors to adhere to the National Council’s Code of Conduct. BHDPC receives funding from a number of sources notably the ‘Precept’, which is a levy collected as part of the Council Tax. BHDPC has the ability to vary this levy and currently receives circa £12,500 p.a for the district. Bomere Heath Parish Council can receive adhoc funding for various initiatives, which SC will support across the county. 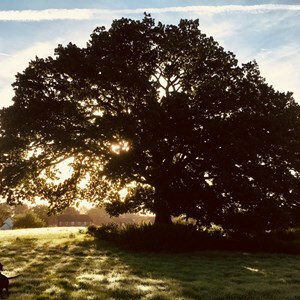 New housing developments within the district will also attract a Community Infrastructure Levy (CIL), which is intended for local authorities to provide the infrastructure as a result of the development. The objectives within this plan will enable BHDPC to assess the demands being placed upon its financial resources and set appropriate budgets for any emerging projects and ‘business as usual’ expenditure. * Parish Councils and Town Councils have the same powers and responsibilities, with Town Councils having greater funding due to the demand for larger facilities. All planning in the United Kingdom is based upon the Government’s National Planning Policy Framework (NPPF). It is from these polices that Shropshire Council draws up Local Plans - Collection of various plans concerned with prioritising and shaping the development of Shropshire up to 2026, which includes numerous Polices under Site Allocations and Management of Development Plan (SAMDev). Current housing development targets for Shropshire are now under review (Dec 2017), however proposals show an increase to 28,750 dwellings across the county over the next 20 years, 28% of which spread across rural communities. SAMDev is already working towards these targets and identifies Community Hubs, which are essentially villages having an existing infrastructure that could support growth. 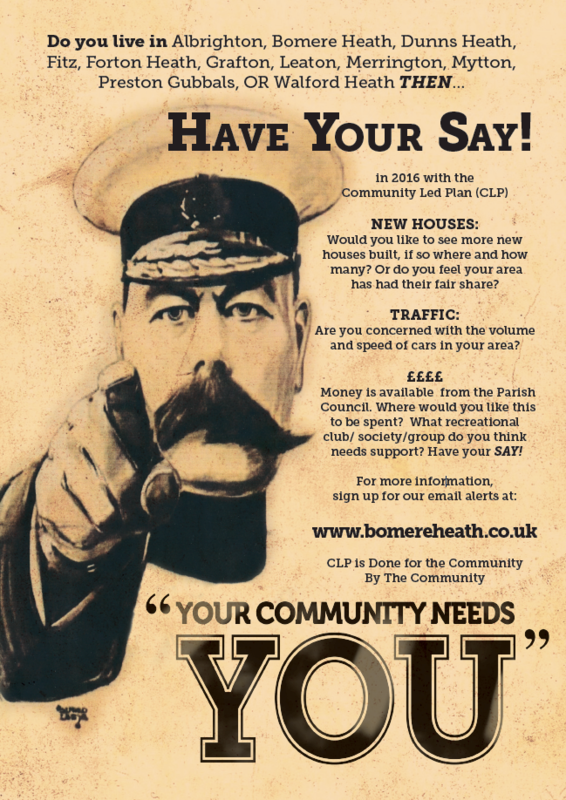 Bomere Heath is currently identified as a Community Hub. The plan also identifies Community Clusters, grouping of smaller settlements, which together could support growth. Fitz, Grafton and Newbanks, Albrighton, Mytton and Walford Heath are identified as Community Clusters. Place Plans across the County help to inform SC of local infrastructure needs, recognising that CIL funding on its own cannot support all such requirements for sustainable growth. Place Plans enable SC infrastructure projects to be prioritised, planned and funded appropriately. BHDPC at the time of this report is carrying out a review of its Place Plan requirements. BHDPC responded to the Local Development Plan Review in April 2017 and identified that under SamDev allocations within the parish district, of the 89 houses identified for development up to 2026, 79 had either been built or permission to build had been granted. The BHDPC response argues that still within the parish, development outside the hub and clusters, exceeded the wishes of the Council at the start of the SamDev process with a further 31 properties built/permission granted. The response queried counting rules and asked that Bomere Heath’s status should be reconsidered and made a Community cluster, with Walford Heath, Fitz and Mytton should be withdrawn from community cluster status. · Current housing needs and views on future development within the parish. · Community spirit, Activities and amenities. 293 responses were received from the 960 questionnaires sent out to households within the Parish. An executive summary of the CLP findings can be found at Appendix B and on the BHDPC web site. This plan is based upon the responsibilities of BHDPC and the Community’s responses to the CLP. The following is a broad overview of the identified issues and the objectives to be achieved and should be read in conjunction with the proposed action plan in the drop down menu on this tab. 42% of respondents to the CLP believed that more development was needed and ideally located (in order) – Bomere Heath, Albrighton, Walford Heath and Leaton. There was a strong support for affordable open market properties to rent or buy for up to 4 bedrooms with opposition to 5+ bedroom properties. The preferred style of building should be in keeping with existing building with a strong response for bungalows. Generally the Community believed that there was sufficient commercial development within the parish, with a strong view against further commercial development. When deciding upon developments within the Parish, due consideration should be given to local demand and the views of the community on the profile of developments being proposed. Due regard will also be given to the impact of such developments and any identifiable adjustments which are required. The Community has voiced concern over dangers arising from traffic speeds identifying several locations within the parish and the necessity for traffic calming measures. The level of accidents in Huffley Lane was of particular concern along with dangerous conditions in Bomere Heath village, Baschurch Rd and Preston Gubbals Road. 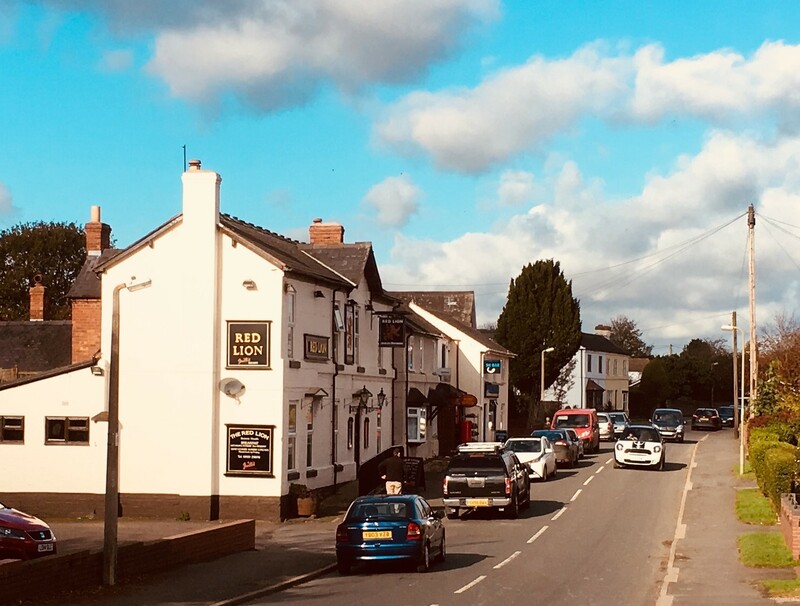 Problems were identified linked to congestion and parking arrangements in Shrewsbury Rd Bomere Heath, and near to Condover College in Grafton. Issues relating to large Heavy Goods vehicles and large agricultural vehicles were identified with suggestions of weight and time restrictions. 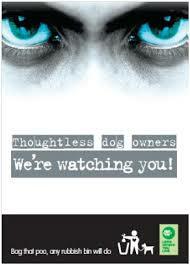 Assessment and research to be undertaken for the speeding risks at the identified locations. Liaison with the relevant authorities and stakeholders in order to identify the most appropriate measures to address the risks posed. Assessment to be made concerning the improvement or provision of additional parking facilities at various locations within the Parish. Consideration as to how large goods and agricultural traffic can be best managed. There was a strong view by the Community to maintain existing hedgerows, green spaces and public footpaths. There was also strong support for a designated public space used for fruit trees. 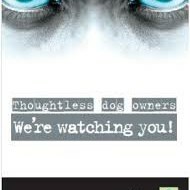 Notable concern was raised in the CLP returns regarding dog fouling at a number of locations and the need for more dog waste bins. 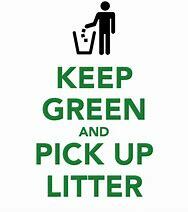 Litter also appeared to be an issue particularly near to the Red Lion Public House, Bomere Heath. 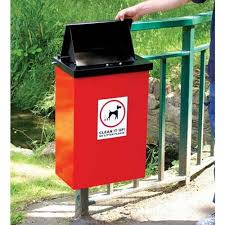 Assessment to be made as to the best location to site dog waste bins and whether there is a need to provide more waste bins. 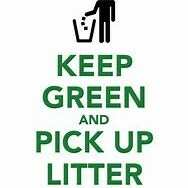 Assessment to include cost of bins, installation and emptying on a regular basis - responsibility. Education: To explore better signage and raising public awareness of public health issues and potential prosecution for repeat offending. There appears to be adequate public benches in the Parish but a number of locations were identified for additional benches. A section of the CLP questionnaire focused on facilities for youths and there appeared strong support for a youth club / group within the Parish. In addition there were suggestions for additional facilities for skate park/ bike ramps, multi sports area and outdoor facility for football. BHDPC has already secured part funding from SC for a potential youth club / group. Assessment to be made concerning the cost of suggested additional leisure facilities and any potential sites within the Parish. Responses in the CLP raised favourable interest in organised events within the Parish. Events such as a Village fete / Summer party and entry into a ‘Best Kept Village’ drew favourable support. The siting of outdoor multi gym equipment within the Parish also drew strong support. While not a specific responsibility, BHDPC should nurture, support and promote greater community participation in specific events and provide reasonable facilities to engender physical and mental wellbeing. BHDPC to continue to assess the methods of passing information onto the community and improving methods of its communication. BHDPC to raise awareness of a willingness to support social events and seek wider Community involvement in the organisation of social events. Assessment to be made on suitable locations and costs, and the degree of financial support required. Assess and seek to improve communication with the Community. There was support for BHDPC to provide allotments within the Parish. There was support for BHDPC to secure land in order that open space facilities could be provided for Community use. 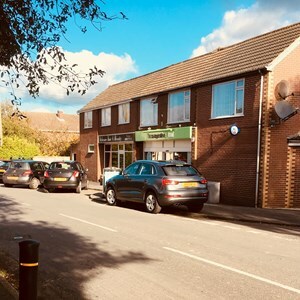 Opportunities within the Parish is limited and with the majority of residents within the Parish either within or near to Bomere Heath, it is reasonable for such a facility to be located at or near to Bomere Heath. Options include the medium / long term rent of land, the purchase and change of use of adjacent farm land or the utilisation of open space assigned to housing developments and adopted by BHDPC. Based upon a viable option to commence a piece of work to asses, cost and acquire land and engage with the Community on this significant project. The Action Plan - that can be found in the drop down menu on the Business Plan tab on the website, sets out the detail of what the issues are against each of the objectives and how BHDPC will work towards achieving those objectives in the current term. The action plan is a living document in that it will enable BHDPC to review and assess its progress and take account of any emerging issues and any need to amend its approach. The Action plan will form the basis of a work programme for identified Councillors in order that the issues can be progressed during the current term.